Open Low and Sell High in this High-Stakes Game Show! It's Time to Play Deal or No Deal! Today is your lucky day! 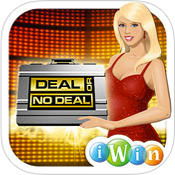 You can now join the excitement of the long-running game show, Deal or No Deal. You won't do so as a member of the audience, but as a bonafide contestant. Pit your wits and test your luck against the Banker as you sift through the briefcases to see if you can get a better deal than he's willing to offer. Will fortune be on your side? Will you be one of the lucky few who get the million dollars? Play Deal or No Deal on your favorite mobile device and find out! Deal or No Deal isn't hard to figure out at all. In fact, it's as simple as opening up a briefcase. You have nearly 30 cases to pick in total that could contain as little as one measly buck or as much as a million dollars. It's your job to figure out which ones have the big money and convince the Banker to give you a good deal. • Eliminate briefcases with low amounts of money to leave room for the big payoffs. • Consider the Banker's offer carefully. Refuse his deal to keep playing in hopes of getting something, or take it to end the game with a solid amount of cash. • Pick a starting briefcase. If you can accept an offer from the Banker that's greater than its monetary value, then you'll win the game. This is not just a straight-up port of Deal or No Deal. This mobile edition is enhanced with features that are guaranteed to make the classic game show more exciting than it ever was before. • Earn experience with every win you eke out to level up and unlock more goodies. 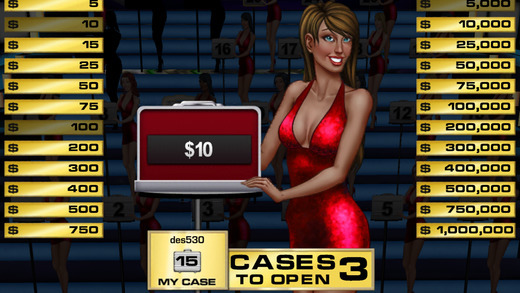 • Get tokens by winning games, completing challenges, or by spinning the wheel. • Includes four game modes: Classic Deal, Tournament Deal, Knock Out and Three Strikes. • Log into Facebook to go head to head against your friends and earn even more tokens. • Purchase or uncover power-ups that will give you an advantage. Increase the amount of money that comes in the briefcases, automatically improve the Banker's offers, earn bonus tokens, and more! With Deal or No Deal, you can experience both the tension and the excitement of the world-famous game show everywhere you go. Pop open those briefcases while you're on break, while you're traveling, or just to kill time on a rainy day, and see if fortune is with you. Praise Lady Luck for opening every low-money case, and curse her name when you lose the million. There's no bad deal to be made when you play Deal or No Deal. 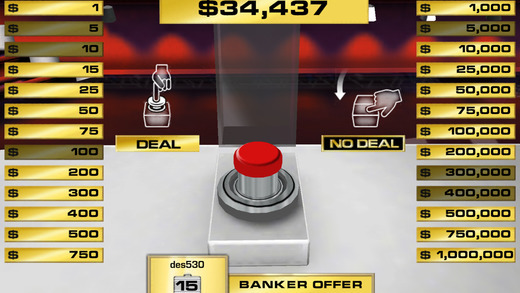 Deal or No Deal is yet another addition in a long line of apps that simulate the rules and gameplay of one of television's most popular game shows. In this case, it's with a pure numbers game where you have to weigh the risk of losing out on a decent payoff for a potentially even greater one. It's a suspenseful affair where every action you take could be something you'll deeply regret, and it's for that reason why Deal or No Deal can be a fun affair. However, it's little more than a game of chance at the end of the day, and much of your enjoyment of the app is going to probably going to depend on how much you like the actual game show. Game show apps have never been known to look all that interesting, and that continues to be the case for Deal or No Deal. It does what it can to give the package some pizzazz and make it look like the show as it appears on TV. The stage is rendered with decent 3D visuals that look pretty good as the camera zooms in, zones out, and pans around, but that's about the best-looking thing you'll see. At the end of the day, this is just a menu-based game with decently-designed backdrops. Even the 26 runway models that open the briefcases aren't much to talk about, particularly since they all appear to be clones of the same woman with different spray-on tans and hair styles. Luckily, everything looks and operates exactly as it should, so there's little to complain about in this department. On the other hand, the sound design is much better. There are a good number of jingles, from the celebratory theme song to the lower and more suspenseful tune that plays while you ponder what case to open. The voice of the host is appropriately peppy, and the audience's cheers and applause helps to make the app feel authentic while giving it some much needed energy. Deal or No Deal is a simple game at heart. You start out by choosing one of 26 briefcases full of money to hold on to, and then proceed to see what's inside the other 25 one by one. They all contain a specific value of money ranging between 1 and 1 million dollars, and each one opened effectively removes it and the money it holds from the game. As you do this, the Banker will periodically offer to buy your personal briefcase off of you, in which case it's your choice to accept it or turn it down. Refuse it and the game goes on, allowing you to knock off more briefcases in hopes of determining how much money your case is really worth. The game ends until you either run out of briefcases or accept the Banker's deal. You win if you accept an offer that's higher than the value of the money in the case. The key to winning Deal or No Deal is to knock off the low-value targets while keeping the high-value ones on the board. Otherwise, the Banker will lowball you as the chances of your briefcase containing something valuable look increasingly slimmer. It sounds like there's a bit of strategy to the game, but the truth is that this is entirely a game of luck. There's no way to determine which briefcase contains which value of cash; all you can do is pick one and hope for the best. There is a nice degree of tension, especially as you narrow the cases down and still have the big-paying million-dollar one lurking around, but there's really no way to even hedge your bets. There are power-ups available that seem like they' were put in to mix things up a bit. They can be found randomly strewn about the briefcases, or they can be bought via tokens at the start of a game. However, all of their effects are passive. Some force the Banker to increase the value of his next offer, some increase the tokens you can get, but none of them really alter the way the game is played. The same can be said about the assorted game modes. There are four in total. Classic Deal is a pretty basic game where it's just you against the computer. The other modes include various forms of multiplayer, but even that doesn't shake things up in any significant way. The only sign of opposition you'll ever see is the monetary value of what the Banker has offered them in comparison to what he's offered you. Trying to get more money than them sounds like it should add a whole new dynamic to the game, but it really doesn't. It's still all just luck of the draw. At the end of the day, Deal or No Deal is a pretty inoffensive product all around. There's absolutely no skill or strategy involved; it's a complete game of luck not at all unlike a slot machine. However, it is accomplishing what it set out to do, which is to simulate the Deal or No Deal experience as it is seen on TV. If that's okay with you, then you'll likely enjoy it immensely. It can be a very addictive app to play, it's fun in quick bursts of time, and it will likely keep you occupied for a bit when things are slow in real life. It's also not a very demanding game either; while you have to spend tokens just to play, it's easy enough to keep a steady stream of them coming in, as long as you don't suffer a horrible string of losses. If you enjoy the old game show, then feel free to give it a look. Just know what you're getting into.